Printed event signs and signage installation is a big part of the business we do here at Barneys. Event signs can come in many forms from simple pull up banners, A-framed sandwich boards, vinyl, key holed banners, vinyl lettering, corflute signs right through to large format canvas signs. 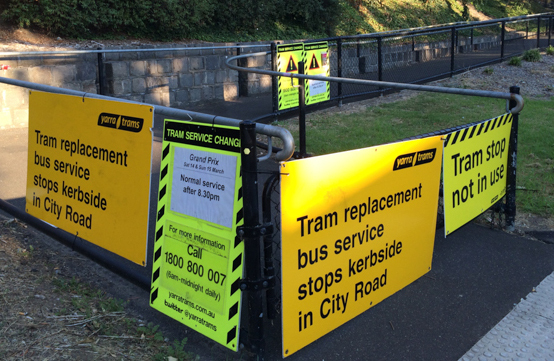 We also print decal signs for cars, buses, trams, trucks as well as signs for tram and bus stops. In the old days most companies would commission a sign writer but as technology has improved incredibly there is so much choice its hard for marketing managers to keep up. We have detailed and up to date knowledge of the type of signs that work best for any given installation and manage the best signage suppliers in Melbourne no matter what type of sign is required. 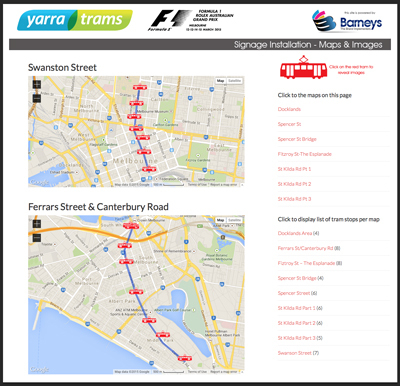 Recently we have achieved an incredible installation feat with Yarra Trams and the Australian Grand Prix. 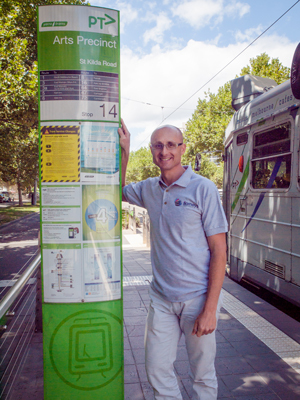 Yarra Trams required redirection signs on over 50 tram stops to accommodate the Australia Grand Prix crowds from different locations from around Melbourne. This required coordinating and installing the multiple signs for the right stop with a couple of days before the Grand Prix and then taken down as soon as the Grand Prix was over. To help with the coordination we created a website for internal use only that shows which sign went where on the tram stop but also the location via Google maps. This included images of the signs and sign content that can know be used for years to come as a reference. Often with print management you need to provide complementary services or provide a service that is not within the normal scope of print management. These extra services are opportunities to look after clients that need more than just signs printed. This case study was complex and required a tight team making sure the signs gave the correct instructions, were stored with easy access and installed and taken down within in the tight parameters so there was no customer confusion.